The Alevis: Will the fallout form the war in Syria make things worse for Turkey’s largest religious minority? The Alevis, Turkey’s largest religious minority, have been persecuted for centuries. Will the fallout from the war in Syria only make things worse? At the end of every service, Alevis repeat the tale of the seventh-century massacre they consider the founding of their faith. ISTANBUL—In many ways, it resembles a traditional mosque. The worshippers slip off their shoes and tread slowly over rows of intricate, hand-woven rugs. Everyone is dressed demurely and the women tie scarves over their hair. Before the prayers begin, they sit cross-legged on the floor. Above them is a domed ceiling, in the center of which dangles a large chandelier. The timing is different from a traditional mosque as well. It is Thursday evening, the time of the week when many Sufis across the Muslim divide gather for spiritual remembrance, rather than Friday afternoon, when most Muslims meet once a week for prayer. There is no pulpit. There isn’t even a niche in the direction of Mecca. Instead, the worshippers sit in a circle of about 50 men and at least twice as many women. They sit near each other, the women as prominently placed as the men. 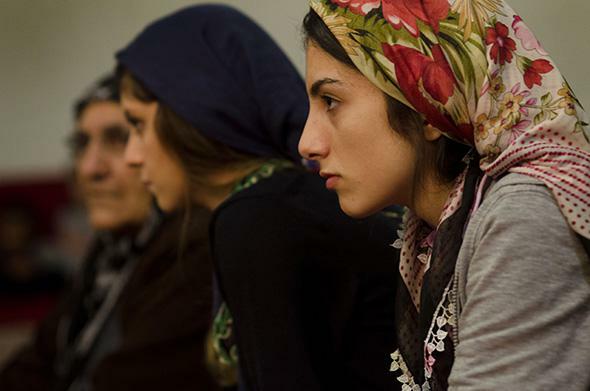 The Alevis are Turkey’s largest religious minority. There are no exact figures for the total population, but estimates range from 7 to 15 million, depending on whom you ask. They live mostly in Turkey but small communities are also scattered in nearby countries. The Alevis have faced ill treatment over the centuries, from the Ottomans to the nationalists in the early days of the Turkish republic. Now, they fear that President Recep Tayyip Erdogan’s government is marginalizing them as it promotes a distinctly Sunni form of majoritarianism, and the fallout from the war in Syria slowly presses into their lives. Alevis follow an ascetic offshoot of Shiism that also incorporates aspects of the mystical branch of Islam known as Sufism. For the Alevis, there is no single “qibla”—the direction Muslims traditionally face to offer prayers to God. 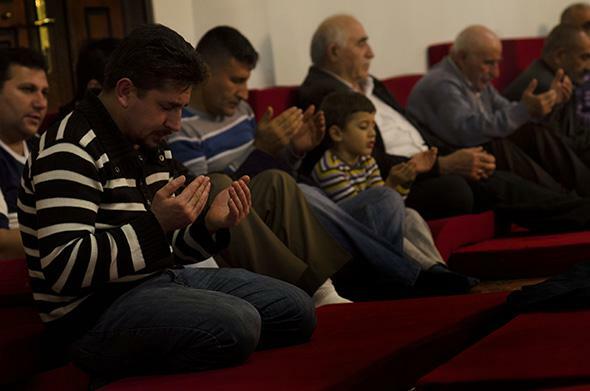 “We have no one direction,” says Veli Gülsoy, the head of the congregation at the Haci Bektas cemevi, or “hall of worship,” in Istanbul’s Gazi neighborhood. “For us, Allah is everywhere. He is very near. He is in our hearts.” Gülsoy is affectionately known by his flock as dede, which means grandfather. Men and women kiss his hand out of respect when they meet him, and never turn their backs toward him. On the cemevi’s top floor is the prayer hall. The floors below host a conference center, a library, and an education center where teachers, in return for a modest fee, offer supplementary lessons in English, the piano, science, chess, and other pursuits. The Haci Bektas cemevi, which has a large portrait of its namesake, a 13th-century mystic revered by Alevis, on the outside of its building, is the largest of its kind in Istanbul. A mural outside the Haci Baktas cemevi in Istanbul’s Gezi neighborhood shows the congregation’s namesake, a 13th-century mystic revered by Alevis. 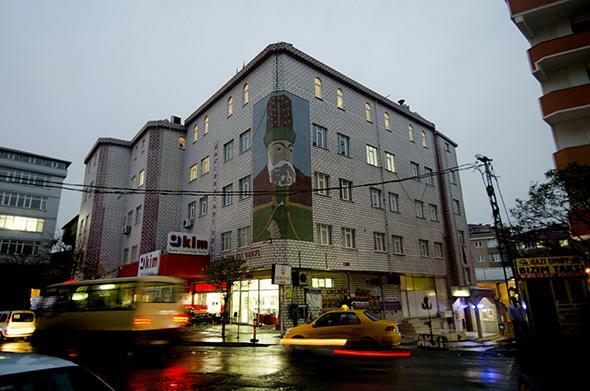 The cemevi is located in the heart of Istanbul’s hardscrabble, working-class Gazi neighborhood. Most of the areas residents are Alevis or Kurds, another beleaguered minority in Turkey, and there’s a recent influx of new arrivals from among the large Syrian refugee population. To add to the mix, Gazi is home to a number of militant left-wing groups who routinely clash with the local police. The cem, or gathering, doesn’t begin with the call to prayer, but the gentle strumming of the balagma, a traditional guitar-like instrument with a thick, holeless base. It is played by the ashik, or lover, who sings hymns of devotion as the worshippers take their places in a circle in front of him. As he eases into a song, some walk over to a 12-sided star marked in the center of the floor, bow down, and kiss it. “It is a way of saying, ‘I’m nothing when it comes to the world,’ ” says Duygu Budak, an Alevi archaeologist and my guide to the proceedings. The dede’s words are interspersed with aphorisms from Sufi greats like Jalaluddin Rumi, the revered 13th-century poet, and the sayings of Imam Ali, Prophet Muhammad’s companion, cousin, and son-in-law. And as far as Alevis and others Shia-influenced groups are concerned, Ali is Muhammad’s true heir. Sunnis believe that Abu Bakr, Mohammed’s father-in-law, was his rightful successor. Ali’s famous forked sword, Zulfikar, is a prominent emblem across the cemevi. The worshippers invoke him in a chant: “Allah, Muhammad, Ya Ali!” It’s their own version of the trinity, but not one of equal parts. They light three candles to represent each, but also to symbolize the lights of the sun, the moon, and the stars. The dede is perched on a thick rug made of lamb’s wool—it is from this that Sufis get their name. “Suf” was the term for wool. Behind him are three portraits, forming another kind of trinity. There is one of peacocks, a bird much-admired by Imam Ali; another of Haci Bektas, the Alevis’ Anatolian forbear; and a third, the most arresting, of Mansur Hallaj, the Persian mystic who would enter trances, attempting to reach God himself, and utter “Ana al-Haq” or “I am the truth.” He was imprisoned by the Abbasids in Baghdad, subject to an 11-year trial for allegedly comparing himself to God, and ultimately executed in public. But under the early Kemalists, the marginalization of Alevis endured. The modern Turkish identity was based on being a Turkish speaker of a Sunni Muslim background. The dedes had their beards shaven, hence Gülsoy’s lonely moustache, and in 1938, the Alevi-led Dersim Rebellion protesting new laws aimed at resettlement saw many Alevis crushed by the state. Worshippers at the cemevi. Women sit alongside men in Alevi services. Her husband, a computer engineer, guitarist, and part-time basketball coach, is from Sivas, a city in central Turkey. The people there vividly recall another massacre, in 1993, when a mob of Salafis—hardline Sunnis—marched on an Alevi conference, and set the attending group of writers and intellectuals on fire. Among the dead was a famed balagma player. Like many Alevis, Budak’s husband is a Kurd. He’s also an atheist. He doesn’t attend the prayer sessions, but helps out at the school. Budak and her husband respect one another’s beliefs. “He has a good heart and that’s enough for me,” she says with a smile, placing an affectionate palm on his shoulder. Outside the cemevi, there are posters of more recent martyrs. When the anti-government protests in Istanbul’s Gezi Park broke out last year, seven people were killed. All of them were Alevi. “Because the Alevis were in front,” says Budak, who went to the protests with her family. The Alevis’ reverence for nature mingled with their left-wing politics to drive opposition to Erdogan’s plans to cut down the park and deepen his increasingly authoritarian rule. After decades of state-enforced secularism, the rise to power of Erdogan’s Islamist AKP party has brought religion back into the Turkish political mainstream. But not all religious groups enjoy equal favor. Some years ago, Erdogan’s government toyed with the idea of reaching out to the Alevis. The community balked, seeing it as a crude bid for their votes. The government has resisted their longstanding demand that the cemevis be recognized alongside mosques, churches, and synagogues as places of worship, meaning they have no access to government funds. And religious instruction in public schools, which is compulsory under the constitution, includes no mention of Alevi beliefs. The war in Syria has heightened their anxiety. The Alevis are distinct but related to Syria’s Alawite minority, which includes most of that country’s ruling elite including President Bashar al-Assad. With the involvement of Sunni extremist groups including ISIS, the conflict has taken on a more explicitly sectarian tone. ISIS’s aggressive push toward the Turkish border, carries particular fears. 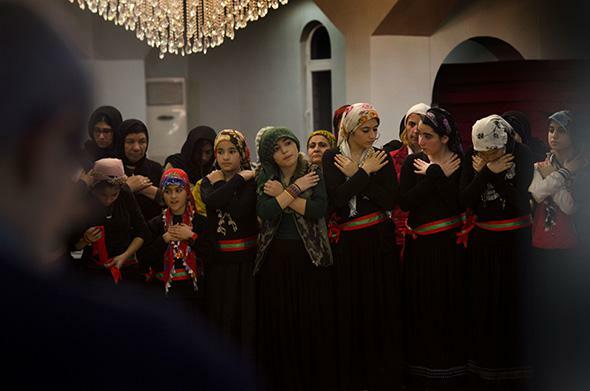 Like the Yazidis, another religious minority who had to flee slaughter at the hands of the Islamic State, the Alevis worry they may also be targeted if ISIS expands into Turkey. The gathering at the cemevi reaches its climax with the performance of the semah, a ritual performance set to music. Members of the faithful rise one by one to form an arc. They hold each other’s hands and then whirl against the backdrop of quickening music, with slow, graceful gestures. One of them involves raising a cupped hand, symbolic of shining a mirror at one’s heart, while the other hand is placed across the chest. With brisk two-steps, they alternate the hands as their feet shuffle forward. “This isn’t a dance,” Budak tells me. “It is a show of our pride.” Erdogan and some of his supporters have mocked the Alevi ritual as a frivolous dance, and the cemevis as sites of decadence. The whirling is traced back by some Alevis to pre-Islamic sixth century Central Asia. A Chinese poet of the time is said to have recorded the practice in verse: Like shivering leaves falling off in the autumn, they whirled in the winter gale/ Like a light fabric made of the rainbow, they whirled as a storm in the skies. Alevi men kneel cross-legged in prayer. Services are held every Thursday evening, rather than Friday afternoon when most Muslims meet for prayer. Once the semah ends, the music slows to a low note. The tale of Husayn, the son of Ali and the most revered Shia saint, is mournfully sung. In 680, Husayn and his group of followers were massacred by Yazid, the tyrannical caliph at the time. The tragedy took place in Kerbala, now in Iraq, and is marked each year in the Muslim month of Muharram, which is currently underway. The congregation begins to weep as the story is told. Some of them lightly pat their chests in a sign of mourning. Others rhythmically stroke their thighs before patting their knees. It’s a light form of self-flagellation.